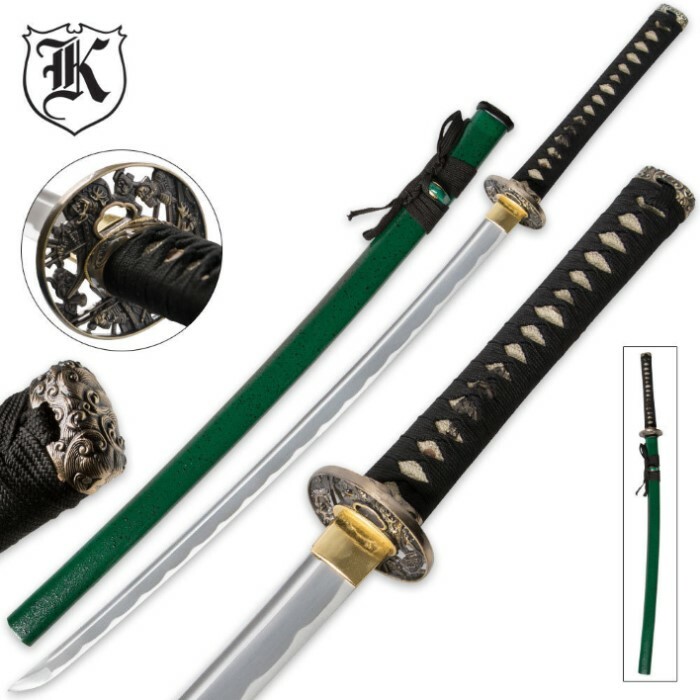 Inspired by the Samurai Katana, this Emerald Dueling Dragon Katana features a hand-forged carbon steel blade built Samurai strong. The 30"" blade is intricately hand forged and meets a custom cast zinc alloy tsuba with an ornate dragon design. The embellishments are antique-finished as well as the cast menuki and pommel. The handle features imitation ray skin and is wrapped in heavy nylon cord. A coordinating wooden scabbard houses the blade. Got the sword a day sooner than expected, it's sharp and is a great conversation starter. very pleased just one thing the pins on the handle are sticking out a bit to much, would totally recommend. i normally wouldn't write reviews but i felt that this sword deserved one. extremely sharp out the box. so sharp that i cut my self just by touching it with my finger. sturdy looks cool and good with self defense. definitely would recommend to a friend. As this is my first sword that I have bought since it is on special. I have to say its pretty good. Only problem it has is it is a bit loose in the saya. Overall I am satisfied with my purchase. Overall, Extremely impressed with this sword. feels better in my hand than several hundred dollar swords. Quality construction. Appears to be full tang or at least half, held with pegs in the traditional style so, impressed with accuracy as well. Stood up well to the light use I've put it through so far. My only complaint is that it is noticeably loose in the saya but, i was so impressed with how much quality i got at such a low price that it didn't effect the rating. still a 5 star sword and i honestly don't think you can do better for the money.